This. This right here. This is the start of summer for me. Strawberry shortcake. For some, the start of summer is the warmer weather, or trading sweaters for swimsuits, or maybe the addition of ice cream as a main food group and replacing water with rosé (! ), the list goes on and on. But for me, it's this classic dessert. Why, you ask? Well, quite simply, besides my great-aunt's homemade pies, shortcake is the one dessert I remember being a constant on the menu at our family summer bbq's. Other things I remember- sneaking all the extra strawberries, taste testing the whipped cream...multiple times, and fighting my sister and my uncle as to who would get the leftover shortcake (because it's just that good). This updated spin on the classic has all the things I enjoyed so much about the original recipe, but with just a few new sophisticated flavors. I left the shortbread virtually untouched, save for the addition of some lavender, because if there's one thing I've learned, it's that you don't mess with a good thing. Instead of fresh strawberries, in this recipe they get seasoned, roasted and paired with the best thing a strawberry can get paired with, rhubarb. Last but not least, I switched out regular whipped cream for a little cremè fraîche, because....adulting?! I mean, it just sounds fancier, right? Truth be told, though, good ol' whipped cream or vanilla ice cream would be just as tasty. 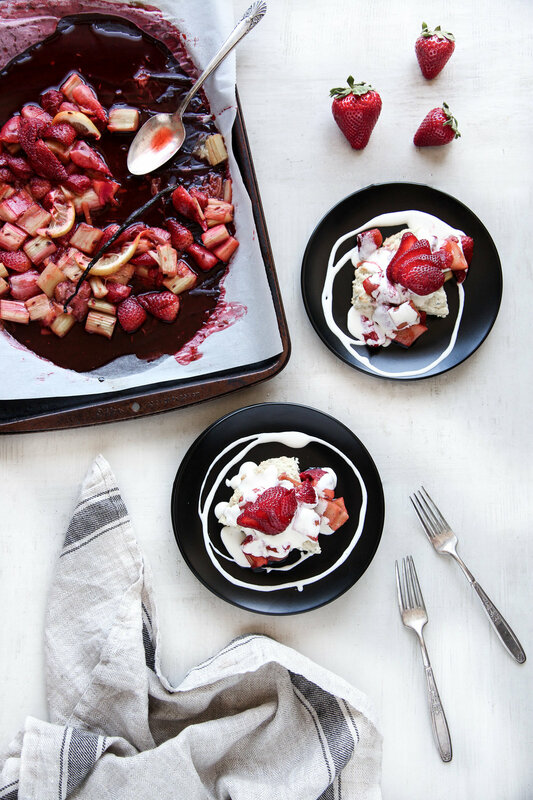 While I think this strawberry rhubarb shortcake would make the perfect dessert on your Memorial Day bbq menu (or really any summer bbq menu, for that matter), I'd love to know, what are your favorite bbq/picnic desserts? In the bowl of a stand mixer, combine the crème fraîche, vanilla and powdered sugar. Beat on medium speed, just until combine, about a minute. Transfer to a serving dish, cover with plastic wrap and refrigerate at least an hour prior to serving. Next, preheat the oven to 425 degrees. Line a baking sheet with parchment paper or a silpat mat and set aside. In a large bowl, combine the flour, baking powder, salt, sugar, lavender and butter. Use your hands to combine the butter into the dry ingredients, until the mixture resembles coarse crumbs. Gradually, stir in the milk, just until combined (as an FYI, the dough will be pretty sticky). Form the dough into a 7"-8" circle on the lined baking sheet, and bake for 8-10 minutes, or just until browned. Gently remove to a cooling rack and allow to rest while you make your sauce. Lower the oven temperature to 375 degrees. Line another baking sheet with parchment paper, or feel free to use the same one as the shortcake, and set aside. 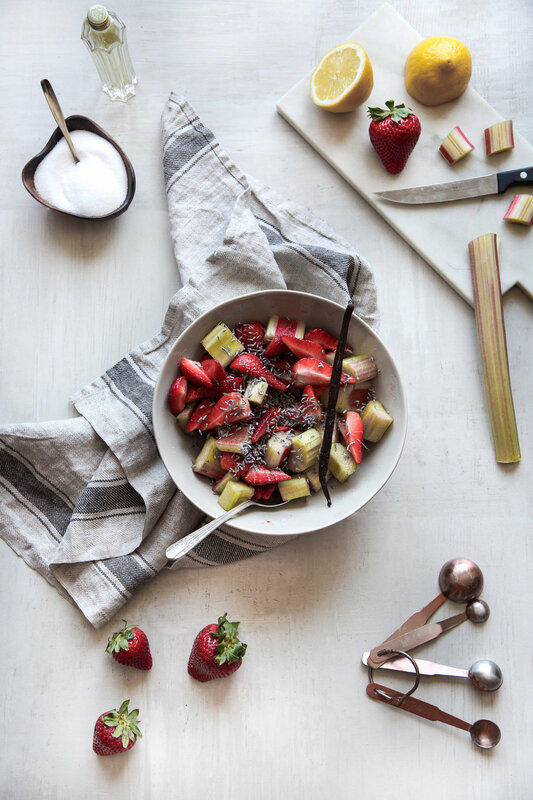 In a large bowl, combine the chopped rhubarb and strawberries. Sprinkle with sugar, lavender, juice of half a lemon and the liquor. Scrape in the vanilla bean, reserving the pod for later. Stir everything to combine and let it sit for 10 minutes. 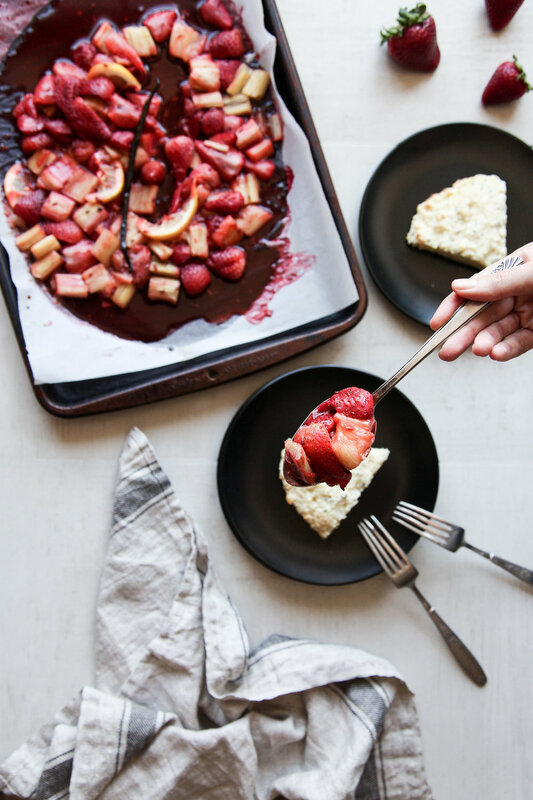 Spread the fruit onto the parchment-lined baking sheet. Add the vanilla bean on top, along with a few thin slices of lemon. Bake for 25-30 minutes, or until the rhubarb is tender. Remove and set aside to cool. To serve, place a piece of shortbread on a plate. Top with fruit, then drizzle with crème fraîche. Enjoy immediately (coffee, tea or rosé optional). I kept all three parts of this dessert relatively low on added sugar so that the flavors could all come through when paired together. If you prefer sweeter desserts, you may want to increase the sugar, especially in the sauce. The sweetened crème fraîche can be made up to two days in advance. Just be sure to store it in the refrigerator in an airtight container. The berry sauce can also be made up to two days in advance. Just be sure to store it in the refrigerator in an airtight container. It can then be served either cold, or you can reheat it for a few minutes in a saucepan set over medium heat, before enjoying. The sauce also tastes excellent on vanilla ice-cream or yogurt.